Give in to While the initial LED light bulbs had harsh colored light and even harsher price tags, today the prices have come down and the products are better. While it seems like a lot to spend $4-$10 for a light bulb, it might last 25 years, so you will definitely get your money’s worth. 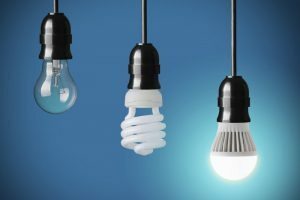 In addition, if you use one 40 watt equivalent LED, 6 hours per day, you can save about $7 vs traditional incandescent bulbs in one year. It pays for itself and the next 24 years or so will be free. Here’s a handy calculator so you can imagine your whole house savings. It’s never too late for a furnace tune–up. Even though your heating system has been running for months, you have not missed the window to benefit from furnace maintenance. A maintenance appointment will save energy because it’s adjusting your equipment to optimal performance and will help to keep it clean. The furnace will last longer, burn its fuel more efficiently, and make you more comfortable. If you are thinking of replacing your older, less efficient furnace, this is a good time to do it. Fox’s HVAC technicians are experts in gas, propane or electric heating and have the latest highly rated energy efficient options. Electrically heated homes can save money when you cast aside your older baseboard heating. To dramatically change your energy bills, switch to ductless heat pump heating. Ductless heat pumps run on electricity, but use far less than baseboard or wall heat, saving between 25%-50% on your heating costs. This can be thousands of dollars saved per year. These savings have been well documented by both the utilities and manufacturers. That is why utilities are offering nice rebates for ductless installations of up to $800. That can make going ductless a double win on your resolutions list. Need more information about making your home energy efficient, Think Out of the Box… Talk to Fox. We serve Seattle and King County 24/7, and our HVAC technicians are ready to help you with your home comfort and energy saving resolutions.